In previous posts we’ve looked at how our political system has become increasingly polarized, with our analysis of voting records showing that many self-styled moderates and independents are exhibiting much more partisan behavior when voting on the House or Senate floor. Having served for a few years now on a PDC open data advisory group, I realized that the same type of analysis could be done for organizational donors. Despite this being public data, not many people in Washington state know who the biggest political donors are, much less who they support. So, are many of these “non-partisan” or “bi-partisan” organizational donors more partisan than they let on? We can figure this out, and the methodology is pretty simple. The PDC Open Data Portal publishes all contributions to candidates and political committees back to 2008. For this first analysis, we looked at donations to partisan legislative and statewide candidates from businesses, unions and political action committees. The partisanship score for each donor is the difference in percentage of donations by party, giving each a range from 100 (exclusively Republican) to -100 (exclusively Democrat). Most of the effort here is involved with the fuzzy matching algorithm, since candidates are very inconsistent on how they report the names of these organizations to the PDC. I use a trigram matching method, which isn’t perfect…but it does pretty well. Currently, contributions are grouped under the same donor if 80% or more of the trigrams match, but this is adjustable. If you visit WhipStat.com, you’ll now find an interactive and animated version of our organizational donor partisan analysis that allows you to filter by jurisdiction type and date range. If you’d like to do further analysis, feel free to hit the Download button for a tab-delimited table of the charted data. Note that for now we don’t display or download the complete donor dataset, as that includes over 8,000 organizations. Some of the biggest legislative donors give heavily to candidates from both parties. About 6% more is given to Democrats than Republicans in legislative races, but that increases to 28% when looking at statewide races. Up next: We’ll take a close look at hard money vs. soft money contributions. Paper can get lost or stolen. Whereas data in TRC is safe and secure. It’s saved on the cloud and TRC’s sandbox model guarantees that your data will never get accidentally overwritten. Once your data is in TRC, it’s easy to conditionally share portions of it with other campaigns. For example, suppose you’re running for a city council race which overlaps another schoolboard race. 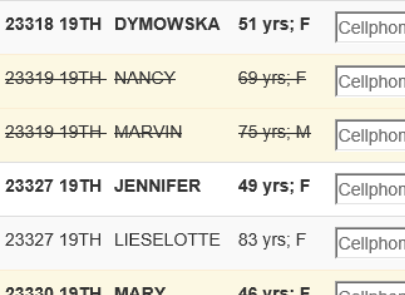 TRC can automatically figure out just the overlapping records and just share those. That analysis is hard to do with paper. Furthermore, suppose you’re canvassing team is asking three separate questions and you only want to share results from one of the questions. Again, once your data is in TRC, you can easily do that controlled granular sharing. 3. Make sure you don’t double-contact the same people. Updating the data on the server ensures your campaign doesn’t accidentally contact the same person multiple times, especially when you have multiple canvassers operating independently. Accidentally contacting the same people multiple times would be wasting resources and could also be perceived as harassment. Knowing your specific supporters lets us run predictive analytics to identify other potential supporters. For example, suppose your district has 50,000 voters. If your canvassing activity identities 200 supporters and another 100 non-supporters, we can then use analytics to search for patterns. Perhaps you’re doing well among certain issues, we can then use predictive analytics to find new likely supporters that are also interested in those issues. That can further refine your target. TRC provides campaign-wide reports for Get-out-the-vote and election predictions. In 2016, these reports were frequently 99% accurate for legislative district races. The more data you provide back to TRC, the more accurate predictions and reports it can provide back you. The TRC canvassing app is sitting in front of a powerful general-purpose service for sharing tabular data files like CSVs. User-management – you can share out a sheet with users, track per-user activity, and revoke permissions. Source Control – TRC provides both branching and full history tracking. Branching means you can create a “child” sheet that has a subset view of the “parent” sheet. Full history tracking means you can track every change. A compute engine – TRC has a general compute fabric for process joins, merges, and aggregations on your data. Sandboxes can then be further partitioned among your volunteers. For example, R1…R5 are individual records. User U1 is synchronizing the data with some external data source, such as NationBuilder or Salesforce. S1 refers to U1’s sandbox. U1 then shares out subsets of the sheet with volunteers on the campaign. This creates a new sandbox S2 for User U2, which has access to rows R3,R4. And another new sandbox, S3, for users U5,U6,U7 which get access to R1 and R2. Since U5,U6, U7 are in the same sandbox (S3), they can see each other’s changes. The system is a distributed hierarchy, so any operation U1 can do in S1; U2 can do in S2. U2 is fully empowered within their sandbox! So U2 can divide their own sandbox and create a new sandbox for U3 and U4 to each edit R4. Since U3 and U4 each have their own sandbox (in contrast to U5,U6,U7 who all share a sandbox), U3 and U4 can edit the same record without conflicting with each other. Their parent (U2) can then resolve any conflict. It allows multiple candidates to run against each other in a primary. They each get their own sandbox. Within a sandbox, it ensures that your data is never overwritten. It allows an untrusted people to submit data to your campaign. The data is just quarantined in its own sandbox and not integrated until proven safe. The full audit log allows purging bad data even after an integration. It’s no secret that our political system has become increasingly polarized in recent years. In fact, Pew Research regularly publishes studies on the topic and the situation is perhaps more grim than you might think. Looking back over the past 60 years, Congress has never been so politically divided, and the result is D.C. gridlock. So how bad is the situation here in Washington State? After serving two terms now in the House of Representatives and being elected to caucus leadership, I have my opinions. There’s certainly evidence to support the assertion that the Legislature is doing much better than Congress, but the partisan divide is alive and well in Olympia. Rather than rely on anecdotal evidence, I was inspired by what Pew and others have done and set out to quantify the problem. A couple of weeks ago I published my first analysis of the partisan distribution of the Washington State Legislature. It also included a Partisan Leaderboard, calling out the members who are least and most likely to cross the aisle. The methodology is simple: The partisanship score for each floor vote is calculated as the percentage of Republican supporters minus the percentage of Democrat supporters, giving each a range from 100 (exclusively Republican) to -100 (exclusively Democrat) with unanimous votes scoring zero. The member’s aggregate score is just the average of all the scores of floor votes they supported, minus the scores from those they opposed. This approach is different than many other studies like the McCarty & Shor (2015) Measuring American Legislatures Project, which use the Political Courage Test (former National Political Awareness Test). Theirs are based on subjective questionnaires, while our scores are based on recorded floor votes. And finally, this updated analysis includes floor votes on amendments, so the scores may be slightly different than those previously published. If you’d like to do further analysis, feel free to hit the Download button for a tab-delimited table of the charted data. Democrats are typically over twice as partisan as Republicans, and even more so in years when there was divided control of the House and Senate. The majority party will control the floor agenda, and so will exhibit more “cohesion” and be less likely to allow members to cross the aisle. The Democrat-controlled House was over twice as likely than the Republican-controlled Senate to bring bills to the floor that were rejected by the opposing party. Some members show willingness to regularly cross the aisle for specific policy areas that are important to them or their constituents. Lobbyists and advocates should take note of these policy areas. Our goal here is simple: To provide some transparency into partisan behavior in our state legislature. There’s nothing inherently wrong with being a partisan voter, and one could argue that a certain degree of caucus cohesion is necessary to be a functioning majority. However, many constituents elected their representatives with the expectation that they would exercise independent thought and work aggressively across the aisle to get results. What they may discover looking at this data is that some of their representatives are more loyal to their partisan ideology than they are to a process that involves compromise to find common ground. Given the example being set in Washington D.C., I also think we should take this moment to recognize those members on both sides of the aisle with the courage to break the partisan gridlock and work in the best interests of our entire state. If you consider yourself an independent, these members deserve your support. Washington State is a vote-by-mail state and voters have about 3 weeks before the election to mail in their ballots. Voter-Science tracks the ballots that are received and provides several tools to aide in your Get-Out-The-Vote (GOTV) efforts. Voter-Science provides GOTV reports – see the Turnout Report plugin. Note – your account must be enabled for Ballot chase in order for this to plugin to work. For example, in the screen shot below, Nancy and Marvin have already voted and so their names have been automatically crossed off. This is critical for get-out-the-vote: if somebody has already cast their ballot, no need to contact them further for gotv. Ballots are tracked by creating a new “XVoted” column in your sheet. It’s a ‘1’ if the ballot has been received. You can also use the Filter tool to filter on XVoted just like any other column and use that to create custom heat maps (Supporters that haven’t voted) or specific child sheets. For map users, a common “Targeted voters” filter is “IsFalse(XVoted) && IsTrue(XTargetPri)”. This means “only include people whose ballot is not yet received and who are on the targeted list”. There is some delay between when a person puts their ballot into the mail, it’s received by the county auditor, and the auditor reports having received it. This is tracked per-county, and counties report at different speeds. This means that if you see a name crossed off, you can be confident the ballot was received. Can you win with 49%? If voters are 50% likely to vote for you, you obviously have a 50% of winning the election. But what are your odds of winning if voters are only 49.9% likely to vote for you? For simplicity, assume that all voters have the same percent P of voting for you. In practice, this more resembles just the “swing” voters, and you will have different categories of voters such as your “base” that is very likely to vote for you and your opponent’s “base” that will never vote for you. But this simplification is still sufficient to illustrate the concepts. 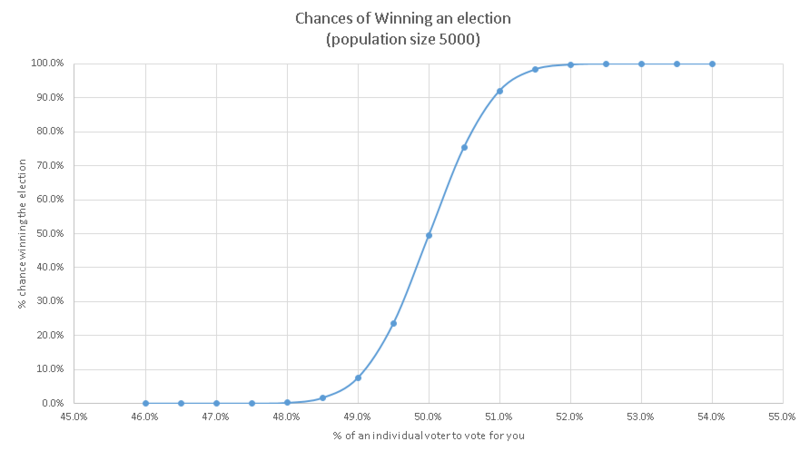 So if P = 50%, obviously you have a 50% chance of winning the election. But what if P drops to 49.5%? Perhaps there’s a natural bias against you due to party, etc. Certainly, your odds of pulling an upset and winning are still greater than 0. But it’s not still 49.5% either. So what are the odds? Say the district size is N. If N=5000 people, dropping P from 50% to 49.5% support means your chances of winning the election would drop from 50% to about 23%! And when P drops to 49%, odds of victory are 7%. Note that this is not linear! Your chances of winning are not just P*N.
How does this depend on population size? It turns out due to the Law of Large numbers, this curve gets even sharper as the population size (N) increases. The law of large numbers means that the larger your sample size, the lower a chance of anomalies occurring. It’s easy to flip 2 heads in a row (25% odds). It’s less likely to flip 10 heads in a row. (.1% chance). In this case, winning an election when P < 50% is “anomaly”. Say voters are 49.9% likely to vote for you. Your odds of winning drop off rapidly as the population increases. 1. 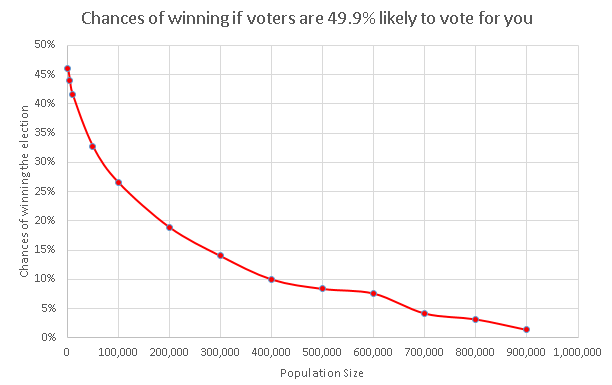 If voters are only 49.9% likely to vote for you, you still have a chance of winning the election. But it’s a steep dropoff (the blue chart). 3. A 49% – 51% election result is actually a solid loss if the population is large.